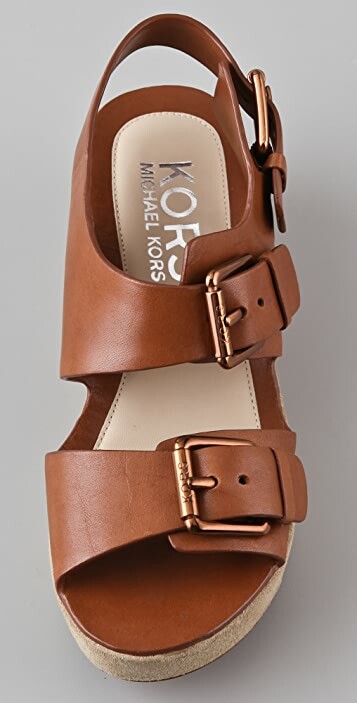 These leather wedge sandals feature buckled straps. 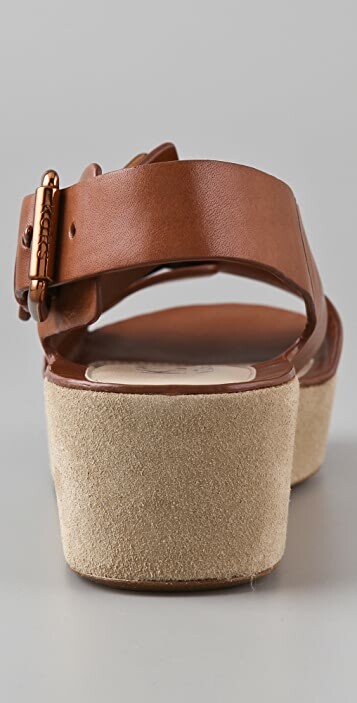 Suede-covered platform and wedge heel. Leather sole. This is the kind of sandal you will be able to get years of use from, a great quality shoe the price maybe a bit higher but the shoe is definitely worth the cost. A bit heavier shoe than a normal thin sole sandal--but that is the look of the shoe. Wear it with a long skirt and feel a little more dressy or a pair of jeans for a more casual look. I love this shoe. The straps are wider and thicker so if someone steps on your heel you won't break the shoe. The colors are great--I wish they had more colors. This sole is about an inch or so high so great for the shorter gals. I'm 5 fott 7 inches and still love the height. Great shoe if you can only take one on a summer vacation. Cute. A little odd, but cute. I stalked these online for quite a while before realizing they weren't going to go on sale in the taupe color anywhere. So I paid full price, and I like the shoes, except for a couple little things. First of all, it's taking me several wearings to break them in -- they seem really comfy at first, but as you wear them, the top strap begins to rub, and I've ended up with some nasty blisters despite taking them out for a short spin or two before trying to go a whole day in them. Now I just wear lots of preventative bandaids, but I hope eventually I won't have to. Also, as a previous reviewer mentioned, the tabs don't want to stay under the little leather loops and pop out really quickly -- there's no way to keep them in there other than buckling the shoe tighter, which I wouldn't want to do because of the blister issue. I'm thinking of gluing down the straps! But they are very cute, and comfy as long as you're not walking around too much. 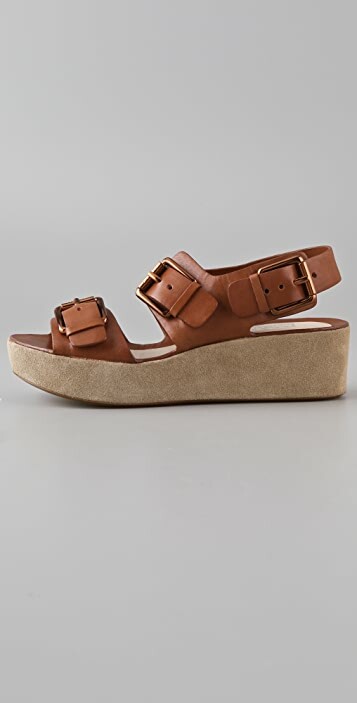 These are a sneaky way of wearing a Birkenstock style sandal that is chic! True to size and very comfortable, I really appreciate the added lift throughout..took off a star because the buckles aren't fully metal but a small leather strip is supposed to hold down the strap but oftentimes does not..this may really be bothersome to some! I have a lot of trouble finding sandals that fit and are comfortable. I have a size 8.5 more narrow foot and the straps always hurt me! These fit me just right and are adjustable as well. I was happily surprised. Great color in the taupe. Height is perfect. I'm 5'8" so these are easy to walk around in for day to day and I don't feel too tall. I gave it 4 stars only because there's no bend to the bottom of the shoe which makes walking a little stiffer, but otherwise, I'll get used to them I'm sure.